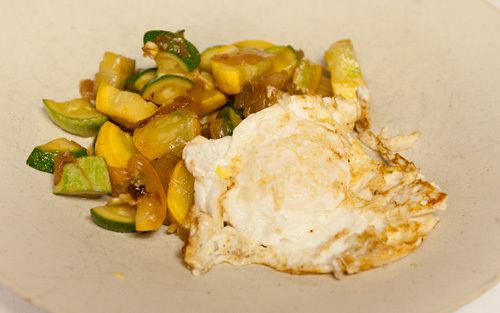 A simple dinner with farmer’s market finds… Squash Saute served with a Fried Egg. I’ve noticed lately that any picture of food with a fried egg in it really gets me drooling. I love the way they look, and even more, I love the way they taste. Creamy, fresh, yummy. This simple preparation and serving is a great easy dinner. Just serve this with some crusty bread and maybe a salad, and you’re all set. 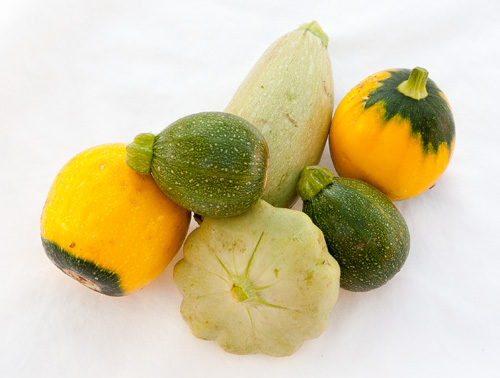 I picked up the squash at the farmer’s market. 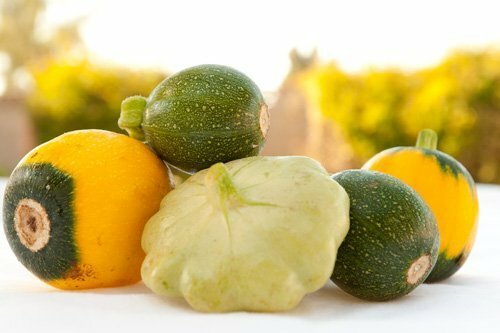 Nice sweet little baby squash. I wanted to do a simple presentation so that I could show off the textures and fresh flavors. I took 1/2 an onion and chopped it. I started the onion browning in some olive oil first. Once it was nearly done, I threw in the chopped squash. Squash don’t take long to cook in a saute like this, so just a few minutes was all they needed. I seasoned this with some salt and pepper. The addition of some fresh herbs like basil or oregano would also be lovely. Chopped mushrooms would also be great in this. Next, fry up the eggs. this is pretty easy to do. And, I did mine over easy. Make sure you have a nice hot non-stick skillet that has some oil in it. I used grapeseed oil because of its light flavor and high smoke point. Once the oil is hot, to the shimmering point, crack in your eggs. Allow them to slightly brown on the edges. For an over easy egg, do one little flip at the end of the cooking. 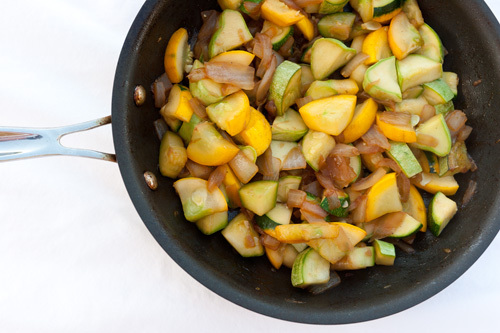 Then slide your egg out onto the plate with the squash saute. Enjoy your nice simple dinner!